A medical device manufacturer needed to reduce the manufacturing cost of a multi-prong infusion needle used for tumor ablatement. 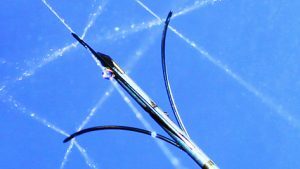 The original design required the use of expensive Nitinol tubing, inflating the cost of the device due to the need for heat-set shaping to achieve a consistently accurate curvature of the collapsible tines. We approached the challenge in two ways: we sought to reduce material costs by replacing the Nitinol tubing with 304 full-hard stainless steel hypo-tubing, and we centralized the entire manufacturing and assembly process within our facility. 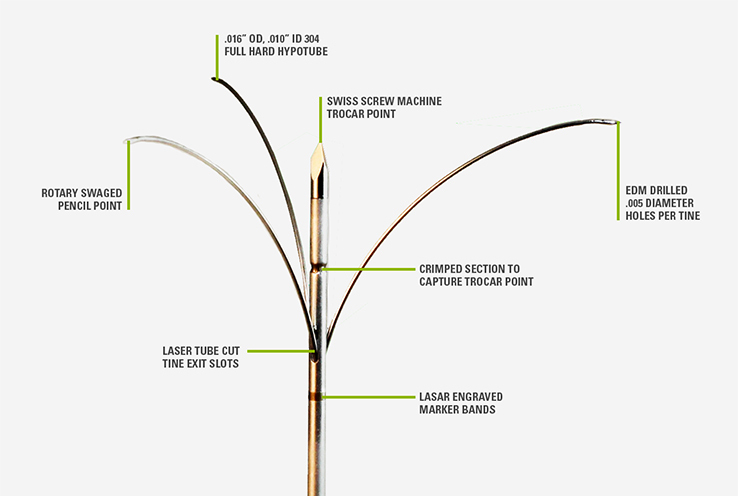 Utilizing proprietary hypo-tube forming and stress-relieving techniques, we were able to manufacture the three collapsing radius tines out of less-expensive stainless steel instead of Nitinol. 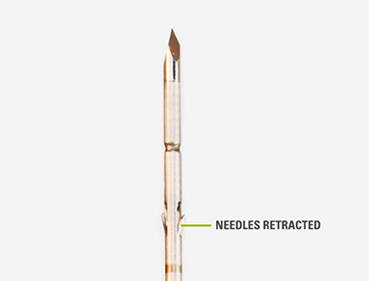 Our process produced tines that could retract into the cannula and re-deploy with the same radius of curvature, even after sterilization and long periods of storage. Each of the three radiused tines were wire EDM drilled with four .005” holes at 90º intervals. The individual tines were designed to telescope through rotary laser-cut windows positioned around the perimeter of the trocar shaft. The trocar shaft was also laser-etched with concentric bands to allow the surgeon to visually identify the insertion depth. The hypo-tubing components were then precision soldered, flow tested and assembled into the final, completed product in Peridot’s clean room. Results: Through smart material specification and streamlined processes, Peridot was able to lower the cost of the client’s product, while also reducing production time and improving product function and reliability.